Exposure to excessive noise is one of the most common causes of hearing loss and tinnitus. It has been estimated that 16% of late-onset hearing loss in adults worldwide (9% in Western Europe) is due to occupational noise. Research on animal models has in detail described the mechanisms causing noise-induced hearing loss (NIHL). Exposure to noise causes metabolic oxidative stress and the production of reactive oxygen species (ROS) resulting in cochlear injury. , Free radical formation induces both necrotic and apoptotic cell death in the organ of Corti, affecting both outer and inner hair cells and marginal cells in the stria vascularis. N-acetylcysteine (NAC) is the antioxidant agent that has been most thoroughly investigated regarding NIHL-protection. NAC has been tested in animal models, and has been shown to provide hearing protection in several studies. ,,,,, In these studies NAC administered before noise exposure is effective to reduce hearing loss and to protect the hair cells. There is, however, no total agreement of the protective effect of NAC. In two animal studies NAC did not reduce the trauma produced by exposure to continous broadband noise, , 105 dB SPL, 8 h/d, 5 days and 104 dB SPL, 1 h, respectively. In most investigations the otoprotective effects of antioxidants have been studied as a preventive measure before noise exposure. However, Kopke et al. also examined the effect of NAC and salicylate administered immediately following noise exposure, and they reported a small but significant reduction in permanent threshold shift, but not in hair cell loss. Choi et al. gave combinations of otoprotective drugs, including NAC to chinchillas after a prolonged exposure to noise. They reported a positive effect of the combination treatment. Lorito et al. studied the protective effects of three different NAC-administrations before and after exposure to noise on albino rats. All administrations, including the one given after the exposure, reduced NIHL significantly. The risk for military personnel to get permanent NIHL as a result of shooting within the ordinary training programme in the Swedish Armed Forces (SAF) is regarded to be very small, provided that the safety instructions are enforced. However, in military services the noise levels are often extreme, and in some situations there can be doubts if level-dependent ear-muffs provide enough attenuation for all subjects. A pronounced exposure to noise occurs during shooting in urban warfare training. These training sessions are performed indoors in bunker-like rooms. The acoustical properties in these spaces are extremely poor. The noise levels are enhanced and the noise character is changed by reflections of the sound by the concrete walls. Urban warfare training has been considered to be a health problem with increased risk for NIHL by the Health Authorities of the SAF. This and other acoustic hazards have enforced the need for a treatment programme to be applied directly after an acoustic accident. Antioxidants offer such an opportunity. The purpose of the investigation was to study how an antioxidant, NAC, can prevent discrete cochlear physiological functions being affected if the drug is administered directly after extreme noise exposure in military personnel. A study of possible protective effect of an antioxidant (NAC) in conjuncture with urban warfare. Thus two similar experiments were performed, one with Swedish safety measures enforced and without treatments (control group), and one with the same safety measures and NAC-treatment (NAC group). The control group consisted of 23 military officers in the Swedish Army. The age of the test subjects ranged from 22 to 50, median 29, mean 31, s.d. 7 years. Two of the officers were women. The NAC group consisted of 11 officers of whom six participated in both parts of the experiment. Five of those who participated in both experiments had apparent effects of the noise exposure in the first experiment, one of the six showed only minor effects. The subjects in the NAC group were younger: Range 21-37 years of age, median 26, mean 27 and s.d. 4 years. The audiograms before shooting, measured according to the next paragraph, are shown in [Figure 1]. Interindividual standard deviations for these mean thresholds, varied between 5.3 and 11.2 dB in the control group, and between 5.8 and 13.8 dB in the NAC group. The range of the thresholds at the high frequencies were −13 to +34 dB in the control group and −13 to +38 dB in the NAC group. See further under Results. During urban warfare training two rounds of blank ammunition, with 20 shots in each, were fired within 2 min from an automatic gun, Ksp-58, in a bunker used for this type of training. Two people were in the bunker at the same time - the right-handed shooter, with exact placement and shooting direction indicated on the floor, and a companion placed close by on his/her right side. This means that they had the weapon between them. Both were wearing their standard level-dependent ear-muffs. These conditions were exactly the same for both groups. In the control condition sound pressure levels were registered by a reference microphone placed on a stand about 2 m from the weapon in the bunker, in the companion's left ear canal and in the shooter's right ear canal by three miniature microphones. The maximum sound pressure levels were 164-166 dB SPL at the reference microphone and 135-154 dB SPL in the ear canal under the hearing protectors (mean 137 dB, range 135-141 dB SPL, except for one subject with ill-fitting hearing protectors, 154 dB SPL). The variation in these levels did not show any significant relation to the results in the hearing tests. They are not further reported here. The NAC treatment consisted of acetylcysteine, 200 mg, (Tika). Four tablets were taken, all of them after exposure: The first tablet, dissolved in half a glass of water, was taken directly after exposure, a second tablet 1 h later, a third one at breakfast the next day, and the fourth and last one an hour later. Tone thresholds for left and right ears separately were measured with pure tones at 1000, 1500, 2000, 3000, 4000, 6000 and 8000 Hz. The psychoacoustical modulation transfer function (PMTF)-test reflects the ability of an ear to follow the natural, slow intensity modulation of speech. This modulation is caused by syllables, words and intonation. An ear with a lesion has a decreased capacity to detect for example soft sounds after loud sounds. The principal difference between normal-hearing and sensorineurally hearing-impaired ears is shown in [Figure 2]. When plotting the thresholds relative to the noise level as a function of the level of the modulated noise you find that normal-hearing subjects have a maximum around 55 dB SPL on the peak-threshold-curve and at an about 10 dB higher noise level on the valley-threshold-curve. A sensorineural hearing loss decreases the height of the maxima and moves them toward higher sound pressure levels. Note that the shape of the curve is the most important feature, not the individual data points. The values at the local maxima of the peak- and valley-threshold curves have been used in statistical analyses and so have the respective noise levels (x-values) of these maxima. In our research about susceptibility to noise induced hearing loss we have found that results from conscripts with basically continuous noise exposure are similar to results from people with sensori­neural hearing loss. Those who have been subjected to shooting incidents with unprotected ears - with impulse noise of not too extreme levels - develop in a contrary way. An example of an accidental impulse noise exposure is shown in [Figure 3], which shows the test results of a conscript at the beginning of military service and and after the accident. The maxima, both on the peak-threshold-curve and the valley-threshold-curve, move toward 45 dB SPL - and they become extremely high. Note the need of an extended scale in the figure! Transient-evoked otoacoustic emissions (TEOAEs) were measured. A contralateral noise was applied to test the function also of the efferent system controlling the outer hair cells. The software used for these measurements is developed at our unit. Clicks with the duration of 80 μs were repeated with a frequency of 50 Hz. The measurement was performed in a non-linear mode to enhance those components in the response, which have a non-linear dependence of the stimulus level, and to suppress the linear components. To accomplish this the polarity of every fourth click is reversed and the sound pressure level is increased by a factor of 3. The acoustical responses from 1000 clicks are averaged, after removal of the primary click by windowing-technique. The stimulus level is specified as so called peak equivalent sound pressure level. TEOAEs at 75 and 85 dB peSPL with and without contralateral masking consisting of 70 dB broadband noise were used in the control condition. In the NAC condition only 85 dB peSPL was used. The RMS-value for the broadband response (the response that is correlated to the clicks), over the interval of measurement, is used as a variable in the analyses as well as the RMS-values in 1000 Hz-bands. Also the uncorrelated response is analysed in 1000 Hz-bands. In another of our projects the same type of effects as for the PMTF-results appeared for the TEOAEs. Those who were subjected to continuous noise (in tanks or army orchestra) showed decreasing TEOAEs, similar to those from a sensorineural hearing loss, whilst those exposed to more impulse sounds (in armed personal carriers with an unusual number of shooting incidents or moments without hearing protectors when leaving the carrier) showed stronger TEOAE responses and intensified chaotic activity which might result from less efferent control of still vigorous outer hair cells. During each day of shooting six people (i.e., three pairs) were exposed. The test subjects were numbered consecutively. A subject with an odd number was a shooter. The subject with the next, even, number was the companion in the pair. For the control group hearing tests were scheduled and performed in a house about 100 m from the bunker on the day preceeding the shooting training and on the day of shooting. When we tested the first subjects we found that PMTF-results were affected at the measurement about 4 hours after shooting. Therefore we asked them to come back for an additional test the next day. With time it was apparent that the PMTF was affected for several subjects. As a result PMTF-measurements were added on the next day for them, and for some subjects also about a week later. For the NAC group test occasions on the next day and 1 week later were scheduled from the start. The test subjects were instructed to avoid noise exposure 24 h before the test. It was not possible to prolong the absence from regular shooting training. Therefore further follow-up measurements could not be made. A test setup with three measuring systems allowed for hearing tests to be performed on three people at a time. The time schedule was adjusted accordingly. 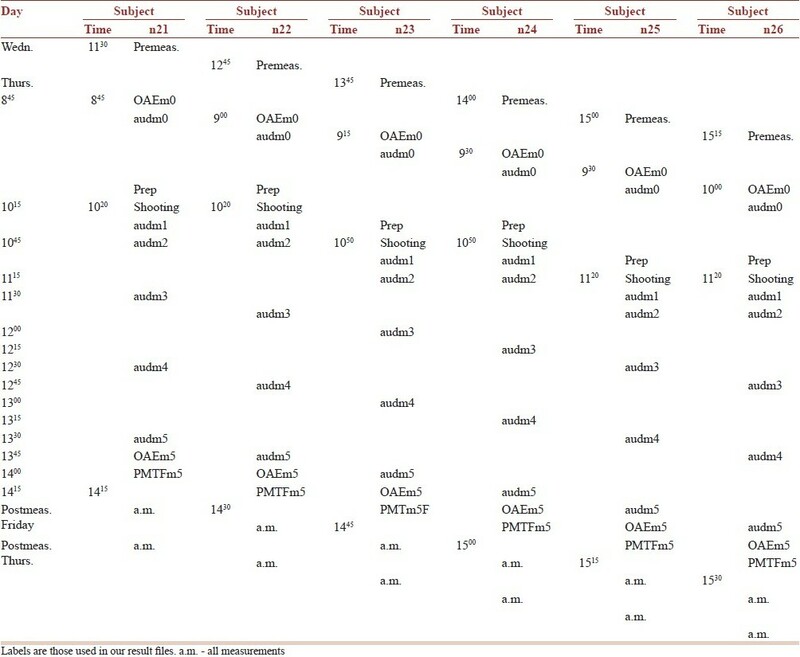 The test parameters for each type of test were chosen to make it possible to start new measurements every 15 minutes [Table 1]. The hearing tests directly after the shooting were performed at the same time for both subjects in a pair. After that the odd numbered subjects performed all the other hearing tests 15 minutes earlier in relation to the shooting than the even numbered ones. During the afternoon of the day before the shooting several tests were carried out. Eardrums were inspected and ear canals were checked for wax, tympanometry was performed, tone thresholds were practised on both ears, i.e., audiogram; eartips for TEOAEs for both ears were chosen and emissions measured. Psychoacoustical modulation transfer function, PMTF, on the left ear was measured. These PMTF-results, measured the day before shooting, were used as reference values for the PMTF before shooting. Reference values for audiogram and left ear TEOAEs were taken the same morning as the shooting, 1.5 hours or less before shooting. 1 hour after shooting (audiogram). 2 hours after shooting (audiogram). 3 hours after shooting (audiogram; TEOAEs and PMTF on left ear). Those in the control group, who, at 3 hours after shooting, showed worse audiograms or PMTFs than pre-exposure, were tested again the next day (if possible). There was no time to evaluate if possible changes in otoacoustic emissions after the measurements had come to an end on the shooting days. For all subjects in the NAC group all the types of measurements were performed again during the next day. If, for a person in the control group, the inspection of results in 7) so implied, further measurements were performed about a week after shooting. In the NAC group everyone was tested again about one week after shooting. Test occasion next week. Three almost identical test systems were used. Each of them consisted of a Tucker-Davis Technologies (System II) module system including signal processor DSP32C, AD/DA-converter and computer controlled amplifiers and attenuators. The TDT-systems were controlled by personal computers. Circumaural earphones, Sennheiser HD 200, were used for the psychoacoustical measurements. Only one of the systems was used for measuring otoacoustic emissions. The probe system used for that was of type ER-10C from Etymotic Research. The program Statistica 9.1 with the module "General linear models" was used for statistical analyses. Details are given under Results. Although six subjects participated in both groups they were treated as different subjects in the statistical analyses. This could give less strength to the analyses but decreased risk of Type I errors. The investigations were commissioned by the SAFs. The regional ethical committee approved the study. An ANOVA was performed with the hearing thresholds as the dependent response variable. Frequency, time after shooting, and ear, were repeated factors, and group (control vs. NAC) was a factor between subjects. This analysis was performed for the measurements from before shooting until, and including, 3 hours after shooting, the last measurement of the control group. The only significant factor was frequency (P<0.00001), where higher mean thresholds at 6 and 8 kHz, 10 and 5 dB HL, respectively, stood out from thresholds, close to 0 dB HL, at other frequencies. Over this time span the factor group was not significant (P=0.609) and the interaction group/time was not significant either (P=0.106). 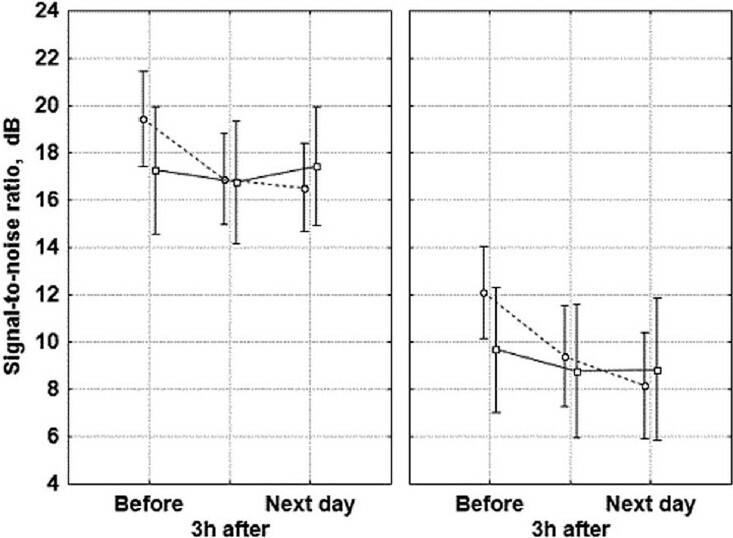 However, in [Figure 4], the NAC group shows a tendency to recovery between 3 hours after the shooting and the next day. Since all the subjects in the NAC group were measured on the next day and next week a separate ANOVA was performed for this group only, with the hearing thresholds at the three frequencies 3, 4, and 6 kHz as dependent response variables and with frequency, ear, and time as repeated factors. The factor time was significant (P=0.007) and the factor frequency (P=0.00001), but no interactions were significant. A Tukey's post-hoc test was performed for the factor time, showing that the result the next day, but not next week, was significantly different from the results 2 hours (P=0.02) and 3 hours (P=0.03) after shooting. During the measurements we noticed that after shooting the subjects took longer time for each threshold and there were unusally large intraindividual variations over time. As an indicator of these fluctuations, both toward worse and better thresholds, we therefore calculated the standard deviation (and variance) for each subject and frequency over the six measurements from the test occasion before shooting up to 3 hours after the shooting. The intraindividual standard deviations in the present study showed the same general frequency dependence as standard deviations for repeated thresholds at conventional audiometry using the same headphone [Figure 5]a. Data for the headphone were taken from an unpublished study of standard deviations for various headphones by one of the authors. However, the fixed-frequency Békésy method, with the parameters used here, has higher accuracy than the conventional audiometry used in the headphone study. Therefore most of the individual standard deviations were slightly smaller in the present study [Figure 5]b. For the control group, with noise exposure without treatment, the intraindividual standard deviations for the left ear were larger than for the right ear at 1-6 kHz. A test of equal variances showed that the variances on the two ears were significantly different at 3 and at 4 kHz, P<0.05 (F 97.5 , d.f. = 22), suggesting a temporary effect on threshold stability of the left ear caused by the exposure. For the NAC group the intraindividual standard deviations for the right ear were the same as for the control group except at 8 kHz. The left ear looked only slightly more influenced by the noise exposure than the right ear. An ANOVA calculated with the individual variances of the hearing thresholds as the dependent response variable, and with frequency, and ear as repeated factors within subjects and group as a factor between subjects showed no significant effect of NAC (P=0.38). However, it is known that the left ear is more vulnerable to noise than the right ear. Therefore a simple t-test of the intraindividual standard deviations for the left ears in the two groups (both groups exposed to noise but with or without NAC) was made and showed an almost significant effect, P=0.06 (one-sided test, unequal variance). That argument speaks in favour of true effects of exposure which are reduced by NAC. The generally most worth-while way of analysing the PMTF-results is to use the thresholds at the maxima of the peak- and valley-curves. In this study the maximum peak- and valley-thresholds show interesting results. A look at the individual results in the control group revealed that for most subjects the maxima were decreasing between the day before the shooting and three hours after exposure, with further decrease in maxima until the next day for several subjects. [Figure 6] shows a few examples. [Figure 7] shows the mean results of the PMTF measurements, performed on the left ear only, for both control and NAC groups. Clear decreases of the maximum peak thresholds are seen from the test occasion before shooting, to the result at the end of the shooting day, 3 hours after shooting. An ANOVA was performed with group (control vs. NAC) as a factor between subjects and with peak-valley and time (before, 3 hours after, next day) as repeated factors within subjects. A subsequent Tukey's post-hoc test was also performed. For the control group both the peak threshold and the valley threshold maxima 3 hours after shooting and the next day were significantly lower than the corresponding values before shooting (P < 0.00013). The NAC group showed no corresponding changes (P>0.8). It can also be noted that in the control condition, on the next day, both peak and valley thresholds were even more affected but the difference from 3 hours after shooting was not significant. In the NAC condition they did not change much after the measurement 3 hours after exposure, possibly because a larger proportion of the subjects had started to recover. An ANOVA was focused on the mid frequency range, 2.5-4.5 kHz, since this frequency range should be most influenced by the exposure. The evoked response in dB SPL was the dependent response variable. Group (control vs. NAC) was a factor between subjects. Repeated factors within subjects were response type (correlated vs. uncorrelated), contralateral noise (off vs. on), and time (before vs. after shooting). Stimulus level was not a factor, since the NAC group was only measured at 85 dB peSPL. Results regarding the efficacy of the NAC treatment are presented first: The factor time was not significant (P=0.16), but the interaction time/group was just inside the significance limit (P=0.0496) and the interaction response type/time/group was also significant (P=0.028). See [Figure 8]. A Tukey's post hoc test showed that the correlated response in the NAC group was significantly higher 3 hours after the shooting than before. There were a few other interactions that were significant, but without interest for the question of the protective effect of NAC. Among these the factor group was significant (P < 0.0039), with the NAC group having 3.2 dB lower response levels, as a mean, than the control group. This was primarily a result of the low response levels of the NAC group measured, untreated, before shooting. Also the factor response type was significant, with the mean level of the correlated response 3.9 dB above that of the uncorrelated response for these relatively normal hearing test subjects. There were no significant changes in contralateral suppression. There are animal studies of the effects of NAC as protection from noise induced hearing loss in which significant reduction of permanent cochlear damage has been found. However, they have failed to demonstrate a large beneficial effect of NAC in reducing temporary threshold shifts. ,,, Ethical limitations for what can be tested on humans in laboratory experiments reduces the possibilities to study NAC as a protector from temporary effects on hearing. Kramer et al. studied persons attending a discotheque. The attendants were randomly selected to receive either NAC or placebo. There were no significant differences in temporary, noise-induced pure tone shift (TTS), or shift in DPOAE amplitude in the two groups. In the present study neither the NAC-group nor the control group showed any TTS. 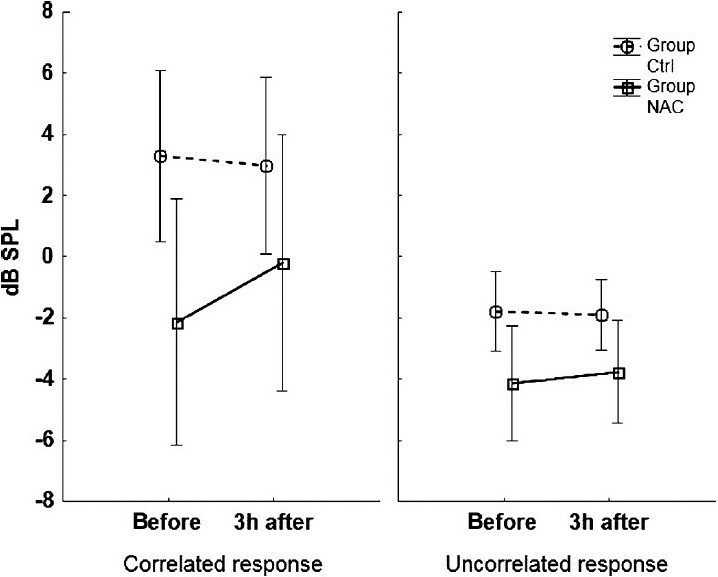 In the NAC group there was an increase in correlated TEOAE response 3 hours after shooting. However, the main differences observed between the groups existed already before shooting and might be attributed to age difference. The control group included a few older officers with larger total exposure, and therefore worse thresholds, but less frequent shooting exercises lately and higher OAE products. The most striking discovery was that the non-linearity of the cochlea, expressed by the PMTF-findings, was practically unchanged in the NAC-group throughout the study. In the control group there was a highly significant decrease in non-linearity after the noise exposure and it was still decreasing at least until the next day for several subjects. Effects of NAC treatment were found for all the three types of hearing measurements. The hearing thresholds showed no conventional TTS after noise exposure, with or without NAC. However, we observed an increased threshold variablitity of the left, noise sensitive, ear in the control group after noise exposure, but not in the NAC-group. It is known that the left ear is more vulnerable to e.g., noise than the right ear. This finding speaks in favour of true effects of exposure which are reduced by NAC. Wagner et al. observed increased DPOAE variability (measured 3 times during the first 30 minutes after exposure to noise) during magnetic resonance imageing. Since there were no TTS (hearing thresholds measured only 8 min after exposure) or DPOAE amplitude reduction in their study, the increased variability was interpreted as an indication of very discrete changes in cochlear activity. However, in the present study the hearing thresholds were measured repeatedly, and TEOAEs were measured only once 3 hours after exposure. The variability of thresholds in our study supports Wagner's interpretation, since NAC reduced the threshold variability in the left ear. Articles by Luz and Hodge,  Hamernik et al.,  and Dancer et al. stress the variablity in time course of the recovery depending, among other parameters, on type of noise exposure, species, and individuals exposed. To our knowledge there are no data from humans regarding indoor shooting. We can only speculate, like those authors, that there were individual varieties of metabolic and structural processes going on in the inner ear causing the large intraindividual variation in thresholds. Regulatory systems that overreact or "underreact" may introduce instability. Numerous studies have shown that exposure to noise, e.g., from weapons or engines, has resulted in amplitude reductions of otoacoustic emissions, TEOAEs and/or DPOAEs, as measured during time spans of days or weeks after impulse noise up to a few years' work in engine rooms. ,, Reduced OAE amplitude levels have been interpreted as an indicator of a risk for future NIHL. , The medial olivocochlear (MOC) system has also been studied after exposure to noise. The results are contradictory with reports of no MOC influence, , and with signs of such an effect when the MOC function was measured after the exposure. In the present study the NAC group, but not the control group, had a significant increase in correlated TEOAE response 3 hours after exposure (which was also 3 hours after the first NAC tablet), but showed no significant change in contralateral suppression. In another project (not yet published) we found hyperactivity after shooting, which might be interpreted as reduced ipsilateral control of OHC. One interpretation is that also NAC, at some stage, reduces the ipsilateral control of the OHC. The PMTF group results, but not every subject's results, changed towards the direction of a sensorineural hearing loss caused by continuous noise exposure both with and without NAC [Figure 2]. Without NAC treatment the results continued to deteriorate at least until the measurement the day after exposure. Similar to the hearing thresholds, the reference values of the PMTF (taken the day before exposure) also differed between the groups. This underlines the importance of more balanced groups regarding hearing and possibly age. For future planning it may be kept in mind that for those in the control group, that had an extra PMTF-measurement 20-30 min after exposure, there was no difference from the results before exposure. The effects came later. The experiments have shown that there were some small, temporary effects on hearing thresholds from shooting 2 times 20 shots in a bare bunker-like room, even with proper hearing protection. The characteristics of the test results, but not the time course of the recovery, indicated exposure from continuous noise-after this exposure to impulse noise in reverberation. The results of the experiment with NAC, in a clinical, low dosage, indicates some protection of the cochlea. This is promising considering the small effects on hearing from the ethically defensible noise exposure, the small and unmatched test groups, and the NAC medication taken only after exposure. Administration of NAC gave some significant changes of the physiology of hearing after exposure. The most striking finding was that the non-linearity of the cochlea, that was strongly reduced in the group without NAC, as manifested by the PMTF-results, was practically unchanged in the NAC-group throughout the study. This project was supported by the Swedish Armed Forces and the University of Michigan, USA. Our sincere thanks to dr. Per-Anders Hellström and captain Michael Millberg for the military arrangements. 1. Nelson DI, Nelson RY, Concha-Barrientos M, Fingerhut M. The global burden of occupational noise-induced hearing loss. Am J Ind Med 2005;48:446-58. 2. Yamane H, Nakai Y, Takayama M, Konishi K, Iguchi H, Nakagawa T, et al. The emergence of free radicals after acoustic trauma and strial blood flow. Acta Otolaryngol Suppl 1995;519:87-92. 3. Ohlemiller KK, Wright JS, Dugan LL. 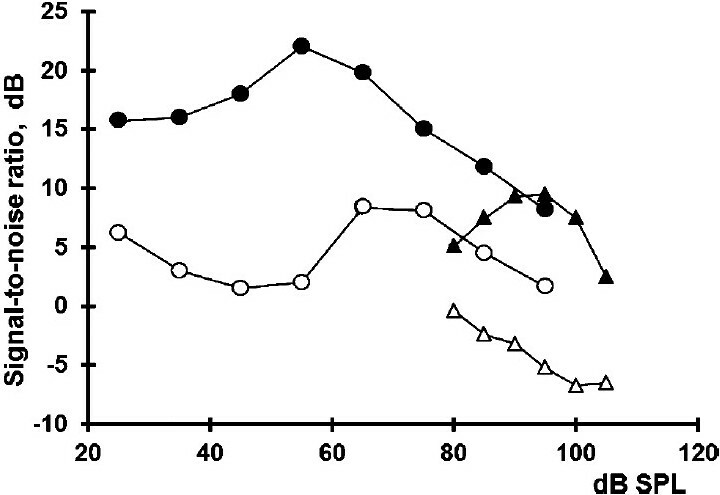 Early elevation of cochlear reactive oxygen species following noise exposure. Audiol Neurootol 1999;4:229-36. 4. Henderson D, McFadden SL, Liu CC, Hight N, Zheng XY. The role of antioxidants in protection from impulse noise. Ann N Y Acad Sci 1999 28;884:368-80. 5. Le Prell CG, Hughes LF, Miller JM. Free radical scavengers vitamins A, C, and E plus magnesium reduce noise trauma. Free Radic Biol Med 2007;42:1454-63. 6. 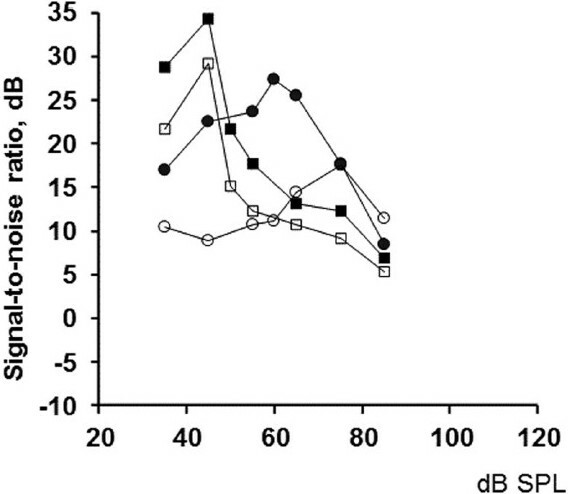 Coleman J, Huang X, Liu J, Kopke R, Jackson R. Dosing study on the effectiveness of salicylate/N-acetylcysteine for prevention of noise-induced hearing loss. Noise Health 2010;12:159-65. 7. Kopke RD, Weisskopf PA, Boone JL, Jackson RL, Wester DC, Hoffer ME, et al. Reduction of noise-induced hearing loss using L-NAC and salicylate in the chinchilla. Hear Res 2000;149:138-46. 8. Kopke R, Bielefeld E, Liu J, Zheng J, Jackson R, Henderson D, et al. Prevention of impulse noise-induced hearing loss with antioxidants. Acta Otolaryngol 2005;125:235-43. 9. Bielefeld EC, Kopke RD, Jackson RL, Coleman JK, Liu J, Henderson D. Noise protection with N-acetyl-l-cysteine (NAC) using a variety of noise exposures, NAC doses, and routes of administration. Acta Otolaryngol 2007;127:914-9. 10. Ohinata Y, Miller JM, Schacht J. Protection from noise-induced lipid peroxidation and hair cell loss in the cochlea. Brain Res 2003;966:265-73. 11. 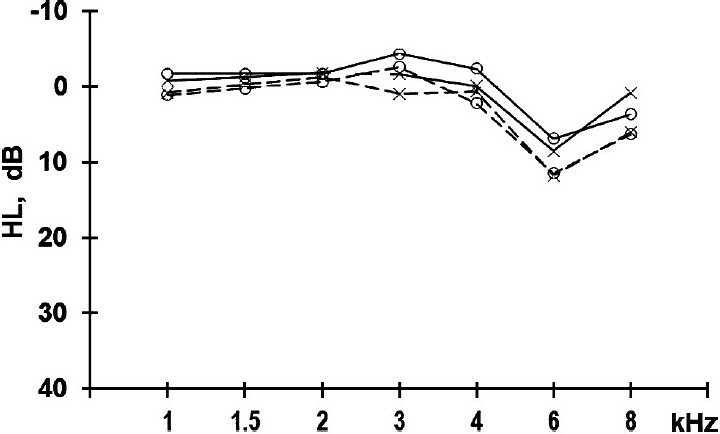 Duan M, Qiu J, Laurell G, Olofsson A, Counter SA, Borg E. Dose and time-dependent protection of the antioxidant N-L-acetylcysteine against impulse noise trauma. Hear Res 2004;192:1-9. 12. Coleman JK, Kopke RD, Liu J, Ge X, Harper EA, Jones GE, et al. Pharmacological rescue of noise induced hearing loss using N-acetylcysteine and acetyl-L-carnitine. Hear Res 2007;226:104-13. 13. Hamernik RP, Qiu W, Davis B. The effectiveness of N-acetyl-L-cysteine (L-NAC) in the prevention of severe noise-induced hearing loss. Hear Res 2008;239:99-106. 14. Davis RR, Custer DA, Krieg E, Alagramam K. N-Acetyl L-Cysteine does not protect mouse ears from the effects of noise*. J Occup Med Toxicol 2010;5:11. 15. Choi CH, Chen K, Vasquez-Weldon A, Jackson RL, Floyd RA, Kopke RD. 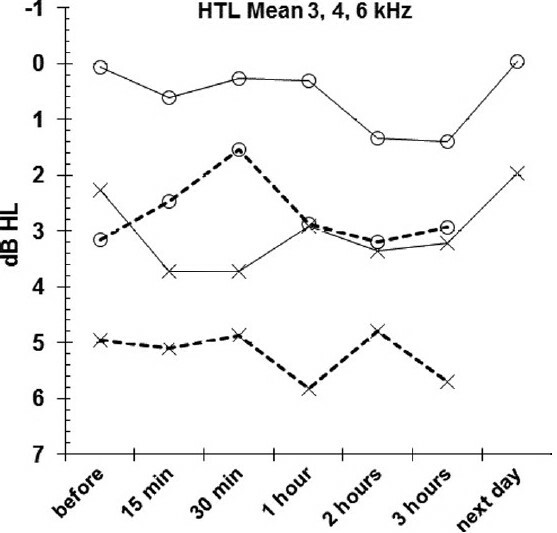 Effectiveness of 4-hydroxy phenyl N-tert-butylnitrone (4-OHPBN) alone and in combination with other antioxidant drugs in the treatment of acute acoustic trauma in chinchilla. Free Radic Biol Med 2008;44:1772-84. 16. Lorito G, Giordano P, Petruccelli J, Martini A, Hatzopoulos S. Different strategies in treating noiseinduced hearing loss with N-acetylcysteine. Med Sci Monit 2008;14: BR159-64. 17. Berninger E, Karlsson KK. Clinical study of Widex Senso on first-time hearing aid users. Scand Audiol 1999;28:117-25. 18. Pirilä T. Left-right asymmetry in the human response to experimental noise exposure. I. Interaural correlation of the temporary threshold shift at 4 kHz frequency. Acta Otolaryngol 1991;111:677-83. 19. Lindblad AC, Hagerman B, Olofsson Å. Tone thresholds in modulated noise. I. Level dependence and relations to SRT in noise for normal-hearing subjects. Techn. Audiol. report No. 125, Karolinska Institutet, Stockholm; 1992. 20. Lindblad AC, Hagerman B. Hearing tests for selection of sonar operators. ACUSTICA - Acta acustica 1999;85:870-6. 21. Lindblad AC, Olofsson Å, Hagerman B. Hearing aid fitting using psychoacoustical modulation transfer functions. In: Beilin J, Jensen GR, editors. Recent developments in hearing instrument technology. Copenhagen: Stougard Jensen; 1993. p. 491-6. 22. Romeo G, Giorgetti M. Therapeutic effects of vitamin A associated with vitamin E in perceptual hearing loss. Acta Vitaminol Enzymol 1985;7:139-43. 23. Takumida M, Anniko M. Radical scavengers for elderly patients with age-related hearing loss. Acta Otolaryngol 2009;129:36-44. 24. Takumida M, Anniko M, Ohtani M. Radical scavengers for Meniere's disease after failure of conventional therapy: A pilot study. Acta Otolaryngol 2003;123:697-703. 25. Joachims HZ, Segal J, Golz A, Netzer A, Goldenberg D. Antioxidants in treatment of idiopathic sudden hearing loss. Otol Neurotol 2003;24:572-5. 26. Klein M, Koedel U, Pfister HW, Kastenbauer S. Meningitis-associated hearing loss: Protection by adjunctive antioxidant therapy. Ann Neurol 2003;54:451-8. 27. Kramer S, Dreisbach L, Lockwood J, Baldwin K, Kopke R, Scranton S, et al. Efficacy of the antioxidant N-acetylcysteine (NAC) in protecting ears exposed to loud music. J Am Acad Audiol 2006;17:265-78. 28. Wagner W, Staud I, Frank G, Dammann F, Plontke S, Plinkert PK. Noise in magnetic resonance imaging: No risk for sensorineural function but increased amplitude variability of otoacoustic emissions. Laryngoscope 2003;113:1216-23. 29. Luz GA, Hodge DC. Recovery from impulse-noise induced TTS in monkeys and men: A descriptive model. J Acoust Soc Am 1971;49:1770-7. 30. Hamernik RP, Ahroon WA, Patterson JA Jr. Threshold recovery functions following impulse noise trauma. J Acoust Soc Am 1988;84:941-50. 31. Dancer A, Grateau P, Cabanis A, Vaillant T, Lafont D. Delayed temporary threshold shift induced by impulse noises (weapon noises) in men. Audiology 1991;30:345-56. 32. Balatsouras DG, Tsimpiris N, Korres S, Karapantzos I, Papadimitriou N, Danielidis V. The effect of impulse noise on distortion product otoacoustic emissions. Int J Audiol 2005;44:540-9. 33. Marshall L, Lapsley Miller JA, Heller LM, Wolgemuth KS, Hughes LM, et al. Detecting incipient inner-ear damage from impulse noise with otoacoustic emissions. J Acoust Soc Am 2009;125:995-1013. 34. Shupak A, Tal D, Sharoni Z, Oren M, Ravid A, Pratt H. Otoacoustic emissions in early noise-induced hearing loss. Otol Neurotol 2007;28:745-52. 35. Lapsley Miller JA, Marshall L, Heller LM, Hughes LM. Low-level otoacoustic emissions may predict susceptibility to noise-induced hearing loss. J Acoust Soc Am 2006;120:280-96. 36. Job A, Raynal M, Kossowski M, Studler M, Ghernaouti C, Baffioni-Venturi A, et al. Otoacoustic detection of risk of early hearing loss in ears with normal audiograms: A 3-year follow-up study. Hear Res 2009;251:10-6. 37. Muller J, Janssen T. Impact of occupational noise on pure-tone threshold and distortion product otoacoustic emissions after one workday. Hear Res 2008;246:9-22. 38. Veuillet E, Martin V, Suc B, Vesson JF, Morgon A, Collet L. Otoacoustic emissions and medial olivocochlear suppression during auditory recovery from acoustic trauma in humans. Acta Otolaryngol 2001;121:278-83. Le Prell, C.G. and Dell, S. and Hensley, B. and Hall III, J.W. and Campbel, K.C.M. and Antonelli, P.J. and Green, G.E. and Miller, J.M. and Guire, K.